I‘ve been wrestling with “Heirs of the Living Body” since finishing Dance of the Happy Shades earlier this year. Originally, the plan was to treat Lives of Girls and Women as a novel; we’d write one post to cover the entire thing and then continue on with Munro’s story collections. But — confession time — at the time, I just couldn’t quite build up the energy I needed to make it through “Heirs of the Living Body.” It is relatively long, for Munro, and exceedingly dense. I stalled, and when I finally got through it we were no longer in full Munro mode, though constantly yearning to get back there. I was very excited, then, when we decided to break the novel into posts about its individual chapters, each of which is a kind of short story of its own. This allowed me to pause at the end of each chapter and dig in on the ones — like this one — that stumped me. So what I have here is further conversion to the belief that Munro is one of our greatest writers. Yes, I already believed that, but then I read a story like this that feels long and convoluted and I see what people who don’t like her mean. And then I consider the story over some time and discover again Munro’s awesome powers. In “Heirs of the Living Body” Del has aged a bit, though she is still young and innocent, though her innocence is steadily breaking down. If in “The Flats Road” we see Del discover that we all rationalize away pain — we lie to others and ourselves, and adults more than others — then in “Heirs of the Living Body” we see her discover death. More than that, we see her feel the shame of the flesh, its fallibility, its odors and embarrassments. Most importantly of all, in this story Del comes to understand that, as much as we might pretend otherwise, life is lived in the embarrassing flesh, not in the grand achievements memorialized in histories. Perhaps because of this story it seemed to me that the gloom spreading out from Aunt Moira had a gynecological odor, like that of the fuzzy, rubberized bandages on her legs. She was a woman I would recognize now as a likely sufferer from varicose veins, hemorrhoids, a dropped womb, cysted ovaries, inflammations, discharges, lumps and stones in various places, one of those heavy, cautiously moving, wrecked survivors of the female life, with stories to tell. And we know Alice Munro is making a kind of statement here, since this is the kind of work she’ll be turning in for the next forty years, dramatizing the daily life of, primarily, women. “Heirs of the Living Body” does much the same thing, becoming the embodiment of the artistic philosophy it conveys. Here we get dramatic events — a funeral, the taste of blood — played out in the daily life of Del’s two aunts on her father’s side and their interactions with Del’s mother, of whom they disapprove. Far from innocuous, it’s these daily interactions that form Del. Besides a physical, female body, she is inheriting all the societal shame that comes with it. As the story ends, she’s been given the privilege of inheriting her uncle’s work and the expectation of carrying it on. She knows this is false, and we see her starting to kick against what’s proper. We see her ambition rising. From this structure hangs a web of concerns, primary among them the lives of girls and women, the way they can get “locked up” or trapped, the way the culture shushes them, the way they shush themselves. Two little old aunts, for instance, retire to Jubilee to a house which was like a “tiny sealed off country.” The story is scattered with traps: a coffin for the old man’s body, a lock-box for his dead history, a store-room that feels like a tomb, a cardboard box in a flooded basement, the river mud that traps a dead cow, a birth canal in which a baby is purposely trapped by its father holding the mother’s legs together, a muddy field in which an assaulted girl is left to die. In addition to all the suffocation, “Heirs of the Living Body” is also scattered with unfinished stories: the bits and pieces of newspaper clippings the old man had collected, things said in passing, the old man’s history, the teenager’s novel. Unfinished lives, unfinished stories, forgotten bits, incomplete explanations, and misunderstood intentions practically sink this story. The story begins, after all, with the “Jenkin’s Bend” sign that Uncle Craig puts on his house, although he is not a Jenkins, although he has no interest in the man who was Jenkins, and as if he is unwittingly signaling to the world he is “around the bend.” But this sense of swirling, this sense of traps and whirlpool is important. The emphasis on entrapment is no accident. Munro’s daughter Sheila remembers her mother saying: “The triumph of my life is that none of the environments I found myself in prevailed over me” (Lives of Mothers & Daughters, p. 111). She might be speaking of her father’s family, who didn’t want people to get above themselves; she might be speaking of her mother, whose freethinking was thought outrageous by everyone else; but she might also have been thinking of Vancouver, where she lived amid suburban pieties for twenty years while bringing up her daughters and trying to write (a masterpiece). She also might be thinking about the swirl of life in general, the swirl that must be made into comprehensible art. Writing about Del, Munro is writing about how hard it is to prevail. Del herself gets caught in a trap — it is fun to spend time with the great aunts at Jenkin’s Bend, sharing their work, the farm, their stories, their pranks. At the same time, the aunts’ world view weighs upon Del: that people should not get above themselves, that Uncle Craig did not push himself into public office, that a cousin gave up a college scholarship, that Uncle Craig was a great writer, that she, Del, should finish his unfinished work, should learn to copy him. Another trap is the possibility of becoming swamped in emotion. Del doesn’t want to go to the uncle’s funeral. In the heat of being there, Del ends up biting Mary Agnes. She is stored in a back room to cool off, where she was swamped in the humiliation of knowing she would now be known forever as “highly strung, erratic, or badly brought up, or a borderline case.” And then, of her own accord, she gets up, leaves her cell, and goes to the funeral. It’s probably no coincidence that Munro uses a psychiatric term — borderline — to describe Del’s state. I think she means to describe the traps an ambitious girl might fall prey to, and one of them is simply being thought unstable. The title of this story is itself a confusing trap. “Heirs of the Living Body” is first and foremost the name of a magazine article Del’s mother cites to her daughter as proof she should not fear death or funerals. Written in the forties, the article foresaw that organ transplants would become routine in the future. But Del’s mother takes it further, much further: “Death as we know it now would be done away with!” Perhaps even brains might be transplanted! “Heirs of the Living Body” garbles a British law term. To be an heir of the body is to be a legal, biological descendent of a person who has died. To be an heir of the living body suggests a paradox. To be the recipient of an organ, such as an eye — or a brain — the donor would have to no longer need it, and as such be practically dead or freshly dead. Munro is playing with the paradox of Uncle Craig and his work — it is alive to him, but it is dead to Del. In essence, writers must each create their own body of work. They cannot actually use transplanted material; they cannot be the transplanted brain of someone else. There is another garbled note to the title: you cannot read “heirs of the living body” without thinking hairs, but the association almost ridicules the grandiose hopes of the article writer, or the grandiose spinning that Del’s mother puts the article in service of: that death will be no more. It’s no accident that when Del bites Mary Agnes, she notices that arm is “downy” — as if that is the writer’s true mission, to notice it all, and notice it true. The Hamlet quote nags at you when you hear the Munro title, but it’s entirely backwards. The one is a fun house approximation of the other. It’s as if Munro is pointing out how words can be appropriated and twisted until the original vision has been destroyed, or how life can be misrepresented by a writer — in this case, the writer of a magazine article, or someone miss-remembering a magazine article. Knowledge, Munro is suggesting, needs to be first-hand, so near you could bite it. There was a whole new language to learn in their house. Conversations there had many levels, nothing could be stated directly, every joke might be a thrust turned inside out. But it is also her mother who insists that Del must go to the funeral, even though she is “too highly strung.” Del thinks about her mother then: “Unpredictable, unreliable, still at the oddest time someone to be grateful for . . .” But it was her mother who insisted that she go, like a possession. Linked to this is the way the family assumes ownership of its own, the way this particular family puts a high stock in lack of worldly ambition, to the degree that Del’s cousin Ruth turns down a college scholarship. In a particularly dreadful way, possession of Mary Agnes was effected first by her father, who held his wife’s legs together on the way to deliver Mary Agnes, who was then said, by Del’s mother, to suffer from “lack of oxygen.” Later, Mary Agnes is herded by a gang of five boys to the fairground where they take possession of her, taking off all her clothes and leaving her in the mud. Munro means Del to be a girl in the mold of Huck Finn — adventurous, bold, observant, and in full possession of herself. Munro means for Del to get out from under. Huck is a boy who, in the end, lights out for the territory. In a book that is about slavery as much as it is about freedom, Huck will not be owned by the Widow Douglas, who wants to civilize him, and he will not be terrorized by his father, who only wants his money. Del is a version of Huck — a girl. She is someone who must also find her own territory. “Heirs of the Living Body” suggests this to me: that the living body is the community in all its disparate versions, and the heirs are those who know it well, love it entirely, because it’s alive, and write about it. But the heirs are also the readers who have in their hands a piece of the living body — a book, a story, an essay. he was the terrible, silent, indifferent conductor of forces that could flare up, in an instant, and burn through this room, all reality, leave us dark. Seeing Uncle Craig’s body for herself is important. She is “glad I had done it after all and survived.” That is how close you need to be to see the truth. That is how close a writer needs to be. I think here the big lesson I’ve learned from last time, is to pay attention to those words that are repeated (the ones that carry thematic significance). I suppose the theme here is “history.” Uncle Craig’s history. But at the same time, Del Jordan’s desire to break from it. The character’s actions carry so much weight. I suppose in the end, when she finally relented, and went to the casket of Uncle Craig, that symbolically meant that she, at least, respected the past. But in the end, when she refuses to put her own writing in the same tin box as her dead uncle’s history, I think Del Jordan is saying, she wants to create her own history, live her own life. Not be shackled down by someone else’s. I loved how Del Jordan’s character was the polar opposite of Mary Agnes. We see this in the cow scene, how Del Jordan is afraid to even touch the cow, but yet Mary Agnes not only touches the cow, but puts the palm of her hand on the cow’s open eye. And then, what do you know, it’s Mary Agnes in that climactic scene who gets into a fight with Del Jordan because Del Jordan refuses to go and see Uncle Craig’s body. There you have that clash of opposing forces … this is as good as Star Wars. LOL. But what I love the most about Munro, is how she brings her characters face to face with their fears/conflicts. Del Jordan didn’t want to face death, and over and over, scene after scene, Munro made Del Jordan confront that very inner conflict. It happened: (1) in the car with her mother talking about death, and she vomits during the discussion; (2) her mother asks her if she wants to go and see Uncle Craig in the casket, Del Jordan says no; (3) Auntie Gracie urges Del Jordan to go to the casket, and she says no, AGAIN; and (4) Mary Agnes tries to force Del Jordan to go see her uncle in the casket, and Del Jordan (at her tipping point) responds with violence, biting Mary Agnes on the arm. That last sentences in the first paragraphs above should read: “She gives you little clues you can PICK UP ON.” (Sorry to end it with a preposition.) LOL. Great stuff, Dwayne. I love that death-list. Thanks for the long comment, Dwaye. I’m thrilled you’re joining in on this! I didn’t focus on her fear of death (or the dead) that much, and I’m thrilled to see so much in the story that I left untapped. Thanks Betsy and Trevor … having a blast. Looking forward to completing this book, slowly. Munro is challenging and exhausting. After one of her stories it’s hard for me to move on to something else. I need to process her, if you know what I mean. Thanks, Dwayne, for joining us. I agree: her stories take me time to sort out. 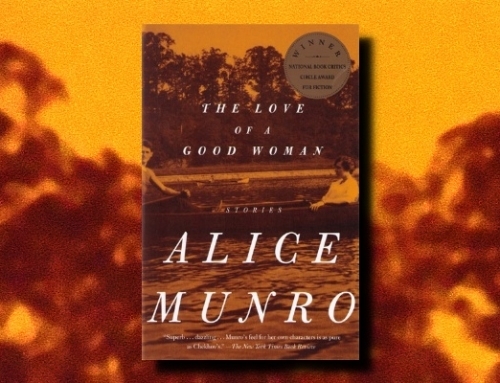 Our hearty congratulations to Alice Munro for her Nobel Prize!